Peach doesn't seem to be the most common flavor for soda. We've done around 160 reviews now, and this is only our second that involves peach, which is a shame because it's a good, sweet flavor. We have done Bundaberg products before, and they've had a good track record, so seeing this recently on the shelves I had to give it a go. First off I enjoy how they call it "Peachee." That's whimsical. Already you know it has to be good. I know as we get older that our tastes can become a little more mature, but with sodas my tastebuds almost always act like a child, and what does a child want to eat, Fruit Loops or Froot Loops? Actually I preferred bran, but that's a whole other issue. Another good sign came with the ingredients. Aside from the bummer of having sodium benzoate, it's sweetened with cane sugar and involves something called "peach brew" which is an ingredient that has it's own ingredients. The highlight is it does contain 5% peach juice, and it's always good to throw the real thing in there. One more note about the ingredients, one of them is "antioxidant." Maybe that offsets the evil of the sodium benzoate. Enough of the build-up, this is quality stuff. It's definitely the best peach soda I've had, again, not that there have been many. It's quite sweet but with a bold peach flavor. Very smooth too, with mild carbonation and just the tiniest bit of bite to give it some variety. In fact each time I take a sip it's a layered experience, where I get the sweet peach candy-type flavor first, and then it ends on the slightly sour bite. 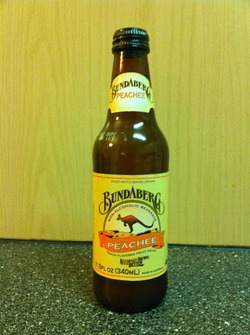 The best peach soda I've had, the best Bundaberg product I've had, and one of the best fruit flavored sodas I've had.